Yokohama Tire Corporation is about to “Race to the Clouds.” The tire maker is teaming up with Porsche Motorsport North America, Porsche Cars North America and the Pikes Peak International Hill Climb Organization for a new class in the world-famous Broadmoor Pikes Peak International Hill Climb. 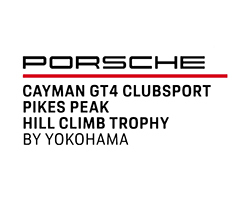 Yokohama is the sponsor and exclusive tire supplier for The Porsche Cayman GT4 Clubsport Pikes Peak Hill Climb Trophy by Yokohama, set for June 18-24, on the legendary Colorado Springs, Colorado course. The new class – the first official one-make Porsche category in the 96-year history of the “Race to the Clouds” – is exclusive to the Porsche Cayman GT4 Clubsport. Eight “invitation-only” entries will compete on Yokohama’s ADVAN A052™ tires. Running in the Pikes Peak Challenge Time Attack Division, three variants of the mid-engine Porsche Cayman GT4 are eligible: the Clubsport, the IMSA GS class-spec Clubsport and the international GT4-specifaction Clubsport MR. The Porsche Cayman GT4 Clubsport is the race variant of the popular road-going Cayman GT4. Porsche Motorsport North America will have race support on site for the entire week of testing, practice, qualifying and the race (June 24). Yokohama will provide tire technical support throughout the week dedicated to the Pikes Peak Challenge Time Attack Division’s Pikes Peak Cup. The new agreement will add to an already extensive list of North American-based motorsports activities both on- and off-road for Yokohama. This includes the Porsche GT3 Cup Challenge USA by Yokohama, the Ultra 94 Porsche GT3 Cup Challenge Canada by Yokohama, 24 Hours of Lemons, Spec MX-5 Challenge, TrophyLite, Yokohama NORRA Mexican 1000 and Yokohama Sonora Rally.